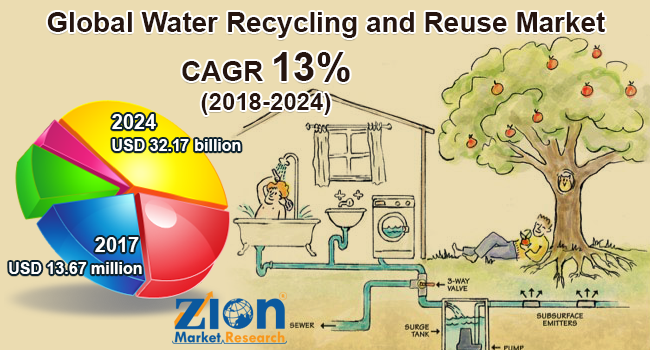 Zion Market Research has published a new report titled “Water Recycle and Reuse Market by Technology (Physical Treatment Technology, Chemical Treatment Technology, and Biological Treatment Technology) and by Application (Agrochemical, Industrial, and Others): Global Industry Perspective, Comprehensive Analysis, and Forecast, 2017 - 2024”. According to the report, global water recycle and reuse market was valued at approximately USD 13.67 million in 2017 and is expected to generate revenue of around USD 32.17 billion by the end of 2024, growing at a CAGR of around 13% between 2018 and 2024. Water Recycle and reuse is the process of treating wastewater with various technologies and converting it into the usable purpose. This process is also called as water reclamation. Recycled water contributes to improving the quality of drinking water and irrigation with such water can reduce the use of chemical fertilizers. In addition to this, water Recycle reduces the need for new water supplies and conserves the existing water resources. Increasing awareness among the people for clean water is the major factor driving the market. For instance, according to the Water Project Organization, 783 million people across the globe do not have access to the clean water. Moreover, 1 in 9 people across the world does not have access to clean drinking water. Therefore, it is the need to focus on the Recycle and reusing of the water. Furthermore, rapidly growing urbanization leads to the water pollution resulting in the scarcity of water as well. Hence, it is necessary to focus on the Recycle and reusing the water which positively influences the market growth during the forecast period. On the basis of technology, the water Recycle and reuse market is fragmented into physical treatment technology, chemical treatment technology, and biological treatment technology. The physical treatment technology is generally referred as the primary treatment. Biological treatment technology is referred as a secondary treatment. Moreover, additional purification with the chemical treatment is referred as advanced treatment. Physical treatment technology accounted for the major revenue share in 2017. The growth is accredited to the advancements in the physical treatment techniques such as flocculation, coagulation, filtration, sedimentation, and others. On the basis of application, the market is bifurcated into agrochemical, industrial, and others. Among these segments, the industrial division is estimated to hold the largest market share. Industries release large volumes of wastewater which is further used for different purposes such as concrete mixing, construction, paper mills, and others. Basically, water used in industrial units for cooling purposes is recovered and treated from municipal wastewater and is recycled before used in these units. Increased industrialization leads to the release of large volumes of wastewater which further tends to increase the demand for water Recycle. Therefore, industrial application is estimated to be the dominant segment during the upcoming years. Regionally, North America is dominating the overall water Recycle and reuse market. The U.S accounted for a significant share in 2017 and is estimated to remain dominant in the upcoming years. This growth is attributed due to the advancements in the water Recycle technologies coupled with the less energy utilized in the water Recycle process. Such factors are considered to drive the market growth in this region during the forecast period.